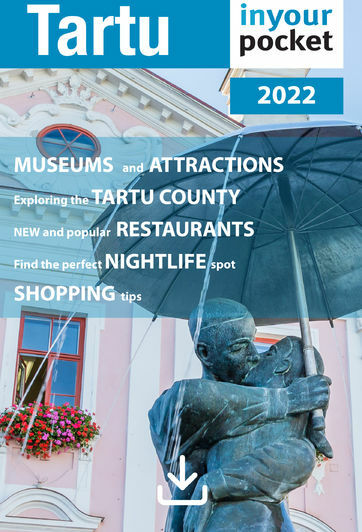 If you're standing on Town Hall Square, you've reached the very heart of Tartu. Since the 13th century, this spot has served as a marketplace, a cultural gathering point, and more recently, a massive outdoor café. Apart from the Town Hall, its most noticeable feature is the somewhat cheeky Kissing Students fountain. This is a relatively recent addition - designed by Mati Karmin and installed in 1998 - but locals have already adopted it as a symbol of the town. The buildings around the square all date from after the 1775 fire. Those on the north side are neo-classical, whereas those on the south side, which was wrecked during World War II, are actually Stalinist. Look carefully and you can still see sickles and hammers in the plaster. At the lower side of the square stands the 'Leaning House' (see below), and the Arch Bridge, which has spanned the Emajőgi since 1959. It replaced the much nicer 18th-century Stone Bridge destroyed in 1944. Taking a daring walk over the top of the arch has become a time-honoured student tradition.